Tuesday, September 11, 2018 - If you thought white folks cannot dance to save their lives then this lady will prove you wrong. 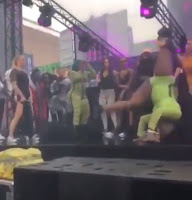 From the video going viral on social media, the Mzungu lady takes on the two black dancers and she gave them a run for their money. She matched them toe-to-toe with every challenge thrown her way much to the surprise of the crowd. Maybe these white chicks are evolving!